Couples Finance: A Game Plan for Your Team - Women and Money Inc. There are many advantages that couples enjoy by sharing their finances – shared expenses, tax benefits, security, etc – which unfortunately single people cannot. However, sharing your finances with a partner is a very complicated issue, which often leads to conflict and even ending the relationship. Marriages, cohabitating couples and other shared finance relationships require a good deal of effort and thought in the money department, as well as cooperation from both parties in order to be successful. 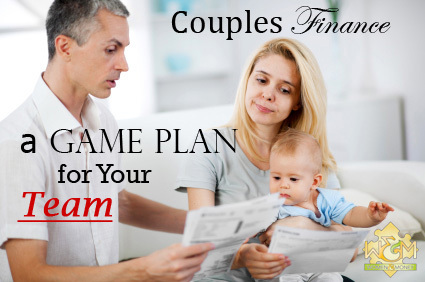 Follow our 4 steps to successful couples finance and develop a game plan for you team. The key first step to a happy financial relationship is to develop a common goal. What is it that you both want to achieve in your life together? Make a list of short term, mid-term and long term goals which both of you truly desire – owning your dream home, travelling/vacation, raising a family, retiring early – whatever is important to you. Once you have your financial goals hashed out, you can start working as a team to achieve them, and they become the motivating, uniting element which binds the relationship and propels you forward. Now you need a plan. You both know where you want to be, so take a look at where you are now and how you’re going to get there. Don’t keep any secrets – be open about all the finances because you both should be equally, fully aware of your financial situation. Create a budget which allocates all of your surplus funds (income minus expenses) towards your common goals. Download our free Monthly Budget Worksheet to get started (available as a printable pdf and an excel document). Long term goal is retirement in 25 years – invest $1000 per month, make extra mortgage payments or…? Now that you see the numbers — are they realistic? Can you increase income, decrease expenses, or extend the timelines in order to reach your goals? Make the decisions together. When you know what is important, it’s easy to see what is not important. Discuss, adjust expectations and make compromises until you have a plan that works for both of you. This is your financial relationship plan – a game plan for your team to score the goals and win the game. In all likelihood, you and your partner have different money styles. One is a spender, the other is a saver. One is into numbers, spreadsheets and financial tracking while the other is nonchalant and carefree over daily finances. This is not a deal breaker. You each need to recognize and acknowledge your differences, and plan around them. The spender needs to have a cap on their discretionary spending, an “allowance” which is included in the budget. Same goes for the carefree partner – if keeping receipts and tracking spending is too much of a chore – set an allowance which covers expenses for agreed categories. For example, $200 per week to cover clothing, eating out, and other personal spends. Aside from having different money styles, another major source of financial strife in a relationship is a sizeable discrepancy in income levels. Particularly in a committed relationship – the goal should be equality. If both parties are putting in equal effort into the relationship (both working full time, or one stays home to raise children and take care of the home, or one is attending school) then both partners are entitled to an equal share of the combined income. When there is not equality in either the effort or the monetary entitlement, resentment will build and could seriously erode the relationship. Both partners need to follow the progress of the plan, so schedule regular meetings as you would a business meeting — where you can focus on the goals and the plan with no distractions. Review your progress and success, and adjust the plan as necessary. Regular review keeps both of you accountable and motivated to your common goals.